Injection Moulding by Lecoplastics Inc.
LECO PLASTICS, INC. manufactures injection molded thermoplastics parts, sized small to large. We are currently serving an ever expanding variety of industries, and are confident that we can become a valued supplier to you. We operate a modern, clean, and well equipped shop utilizing state-of-the art equipment, Staffed with the best toolmakers. All are qualified professionals and very dedicated workers. Our in-house molding facilities are capable of using the widest available spectrum of materials. 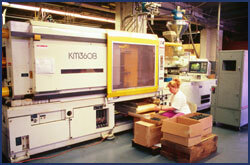 We have a proven track record of expertise in a wide array of molded products. We can also provide you with expert engineering assistance to help you achieve greater cost savings, higher quality and increased efficiency.